The Trump administration now plans to appeal our landmark court victory restoring protection to Yellowstone's grizzlies and halting trophy hunts in Wyoming and Idaho. It's not surprising. Trump's anti-wildlife appointees stripped Endangered Species Act protection from these bears in 2017, paving the way for hunts of up to 20 bears if they strayed over the national park boundary. The Center for Biological Diversity and allies sued, winning back the bears' protection in September. We'll resist this latest move too, of course. "Rather than create a plan to truly recover grizzlies in the West, the Trump administration wants to spend more time and money in court," said the Center's Andrea Santarsiere. "It's ludicrous." 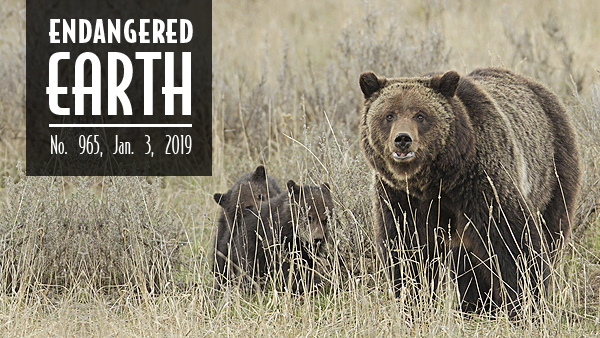 Get more from NBC News and consider donating to our fight to save Yellowstone grizzlies. The Center and Tennessee Riverkeeper have reached an agreement with Mazda Toyota Manufacturing, U.S.A. to protect the critically endangered spring pygmy sunfish and minimize impacts from a planned automobile manufacturing plant in Huntsville, Ala. The agreement will protect at least 1,100 acres of the Beaverdam Spring and Creek Complex where the sunfish lives and provide $6 million to conserve the species and its habitat. The land will be protected in its natural state and restricted to low-impact uses. This agreement was reached after the Center raised concerns in a notice of intent to sue under the Endangered Species Act. "With this agreement, the sunfish has more than a fighting chance to make it," said the Center's Elise Bennett. Of the many thrills offered by life, discovering a new species of gigantic salamander with frilly cheeks and delightful spots has to be up there on the list. 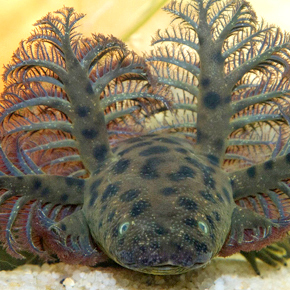 After decades of rumors and searches, the existence of a two-foot-long amphibian called the "reticulated siren" has finally been confirmed. Read The Revelator's story of how biologist David Steen found this magnificent swamp denizen, and sign up for The Revelator's weekly newsletter. Western yellow-billed cuckoos will finally get protection for some of their most important habitat. After a Center lawsuit, the U.S. Fish and Wildlife Service has agreed to finalize habitat safeguards by August 2020. It's the latest news in our long fight to save these songbirds, which once ranged across the U.S. West but have declined to only about 350 pairs. We sought the birds' protection back in 1998. They were finally listed as a threatened species in 2014, along with a proposal to protect more than 500,000 acres. But that proposal was never finalized, so we sued. "This victory will provide an essential safety net for these beautiful birds," said the Center's Brian Segee. Read more in The Daily Sentinel. After years of work by the Center and allies, a small southeastern fish called the trispot darter has finally won protection under the Endangered Species Act — along with a proposal for 180 miles of river safeguards. The darter is glamorously colored and migrates like a miniature salmon. 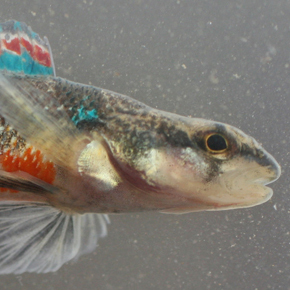 "Protecting the trispot darter will safeguard this colorful little fish for future generations and help protect water quality for nearby communities," said Tierra Curry, a senior scientist at the Center. Read more. The Trump administration never stops inviting fossil fuel interests to ravage our public lands for profit. Most recently, the feds released a draft study preparing for an oil and gas lease sale in the Arctic National Wildlife Refuge. 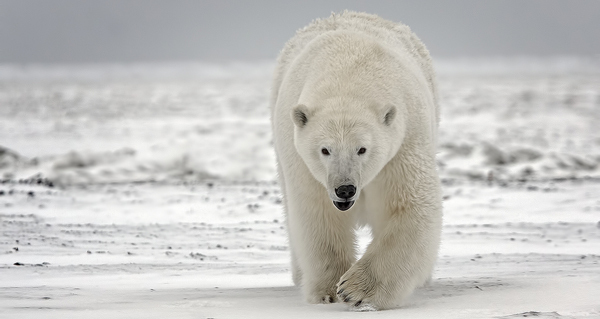 This 19.3-million-acre northern wilderness is home to diverse and stunning Arctic wildlife, including polar and grizzly bears, wolves, and the great Porcupine caribou herd. "Once we industrialize our last great Alaskan wilderness areas, there's no going back," said Kierán Suckling, the Center's executive director. "We have to make a stand against Trump's ignorance and greed. Here's where we protect our environment or accept climate chaos and the extinction crisis." Read more in The Maritime Executive. U.S. Navy training exercises in the Pacific could kill, injure or harass marine mammals 12.5 million times over the next five years, according to permits just approved by the Trump administration. These exercises could injure 3,346 marine mammals, from dolphins to critically endangered blue whales. Training-related sonar, explosions and ship strikes harm ocean mammals' hearing, needed for navigation, feeding and reproduction. We've already sued over such abuses, and we won't stop now. Read more. 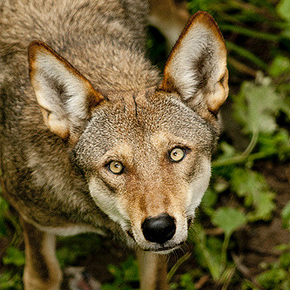 The Endangered Species Coalition — a national network including the Center — has named 10 species at greatest risk from Trump-era attacks on the Endangered Species Act. The list includes California condors, red wolves, hellbenders, giraffes, Humboldt martens, West Indian manatees, San Bernardino kangaroo rats and more. The coalition calls the Trump administration's proposed regulations for threatened species "an extinction plan." Learn more. Check out the latest footage from the Center's borderlands critter cams ... which are sometimes checked by a wildlife-loving kindergartner. Watch it now on Facebook or YouTube. Photo credits: Photo credits: Yellowstone grizzly bear sow and cubs by Jim Peaco/NPS; spring pygmy sunfish courtesy Conservation Fisheries; reticulated siren by Pierson Hill; yellow-billed cuckoo by Jay Bass/Flickr; trispot darter by Bernard Kuhajda; polar bear by Alan D. Wilson/Nature's Pics Online; long-beaked dolphin courtesy NOAA; red wolf by Amelia Beamish/Flickr; deer by Russ McSpadden/Center for Biological Diversity.